The first to lift off was a Virginia born, country singer named Jeremy Harrell who signed a distribution deal, but his camp has gone quiet since. Swift Slay of Miami would seem to be on his way, but after a major kick-off, he may need to hit the restart switch. Having an artist – one that truly loves and respects time spent in The Neighborhood – go mainstream, or become a pop idol, and then shine down their light, by giving a shout out to thepublicblogger, has always been one of the avenues, believed, that would elevate the platform and spread to other artists in a wave. But should a higher influence come our way, The Neighborhood will always be for the underground and indie artists. A Star is Born Title Holder and named 2015 Best Performance of the Year: New Crunchy Mom Rebecca Lemke has now taken aim. A featured article in The Huff Post may not be the type of indicator most think of, but if you knew Rebecca and how dedicated and ambitious and respectful and talented and embracing she is, you would understand why the artists that know her, held a little celebration on a Facebook post in her honor. An Unlikely Friendship Between a Pregnant Collegiate and a Gentle Black Man is a heartwarming real life interaction between two people, that on paper, never should have met, and a friendship? an impossible bet. It scores a much needed counter blow, to stabilize the headline stories of racial hate, that seem to appear more often..A first step or a fortunate occasion, either way we are proud of Rebecca for her continual hard work and appreciate her loyalty, as she mentions thepublicblogger in her opening bio. Measuring small steps? Counting unhatched chickens? None of the above. Nourishing relationships, supporting friends, contributing toward the rise of a young artist, all take work. So when we celebrate their victories, we are also in celebration of self. 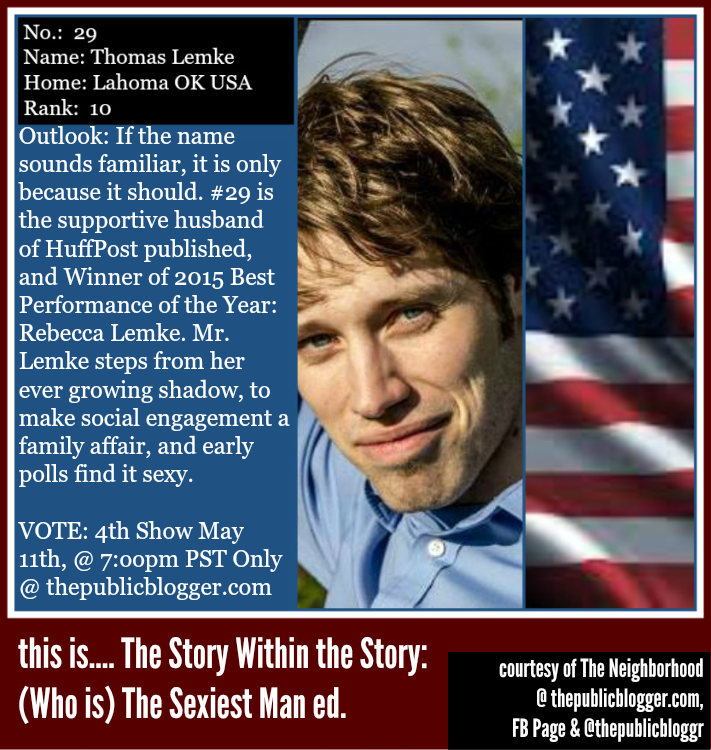 #29 Thomas Lemke, Rebecca’s supportive husband, begins his own ascent. Its always nice to see the underdog win, it truly is. It makes for the better story. If you have the time, please check out my blog at Gastradamus and let us know what you think of our new story called, “The Young and the Brestless, its a movie piece of literature. Thank you for adding your voice and we appreciate the words of support. I will make it a point visit Gastradamus shortly. I read this with tears in my eyes. The Neighborhood has offered me something that the Huffington Post never can, a community that will always have my back and believed in me from day one, when I didn’t believe in myself. ❤ Thank you to every Neighbor.